Chloride ion content sampling, samples are submitted to a UKAS accredited laboratory for chemical and physical analysis. Our testing regime is strictly in accordance with BRE IP 21/86 and the concrete society report No. 32.3no. Depth of carbonation using Phenolphthalein indicator solution in accordance with BRE IP 6/81. Core samples / concrete strength testing at UKAS accredited laboratory in accordance with BS EN 12504. Cover meter surveys to BS1881. Our covermeters are calibrated by a UKAS accredited labortory. 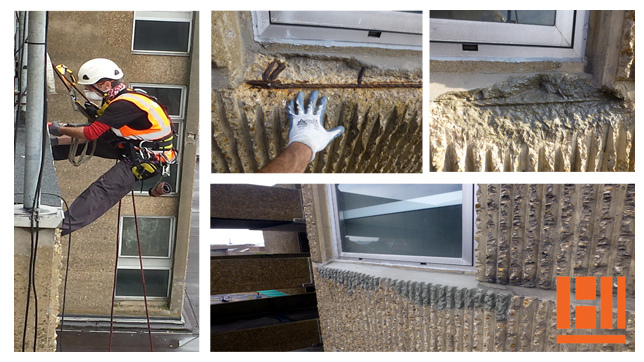 Safe removal of loose material and repairs if required using fosroc products. Reinforcement mapping and breakout to ascertain bar dimensions. © Hancock Industrial Abseiling Ltd. All Rights Reserved.